We all know about Big Al’s bloody saddle but have you ever heard of the Great Movie Ride’s bloody shirt? Thanks to a kind reader and original cast member who helped open the Great Movie Ride in 1989 we have unearthed a remarkably interesting tidbit that we had never seen (and are betting you have not either). We were surprised to find out that many guests did not realize that the Great Movie Ride indeed had two totally different “hijack” scenes: the relatively simple gangster scene (featuring a full scale gangster car and shoot out) or the more complex cowboy scene highlighting live fire, an interactive Audio Animatronic gunslinger and apparently at one time even some blood and gore! The original script called for the cowboy hijacker; (either “Ma Durango” or “Kid Holstein”, yes, the characters had actual names), to deliver a potentially fatal chest shot to the tour guide as they seized control of the ride vehicle (Note: Another reader has let us know the gunshot was actually intended for “Mugsy” in the gangster scene, see comment below). The cast member was meant to spin around feigning impact while simultaneously ripping off a removable flap exposing a bloody chest wound. While this is no doubt a very cool detail it is also no wonder why it got pulled prior to opening. We are uncertain if the gangster scene (it was only the gangster scene) had a similarly gory reveal but it is interesting to see just how far the Imagineers wanted to take things. Please don’t forget your name tag, the punishment is SEVERE! 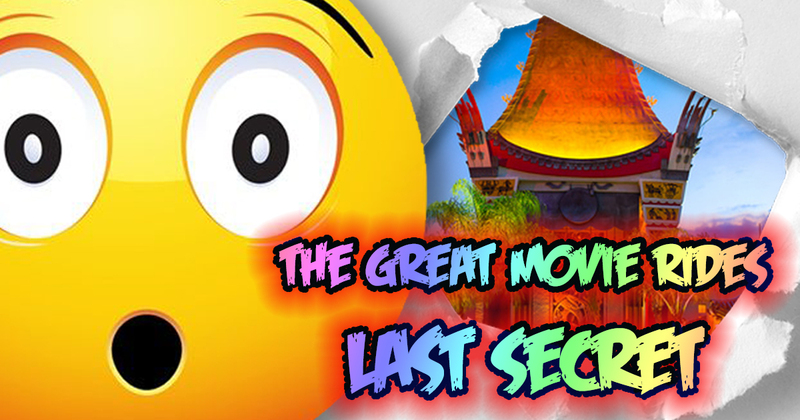 Speaking of the original script for The Great Movie Ride, it was over 60 pages long! As a former Jungle Cruise Skipper trust me when I tell you that is a LOT! That original script used virtually no recorded narration and instead depended solely on the talents of the live hosts (ala: The Jungle Cruise), this of course changed prior to opening and the live narration was reduced even further in the most recent refurbishment. It is a shame that the acting abilities of the Great Movie Ride hosts were not allowed to shine more, I am sure there would have been some memorable “Writhing in agony” gunshot performances. Now The Great Movie Ride has had its last run, the cast members have taken their final bows and workers are in the building sledge-hammering our childhoods. 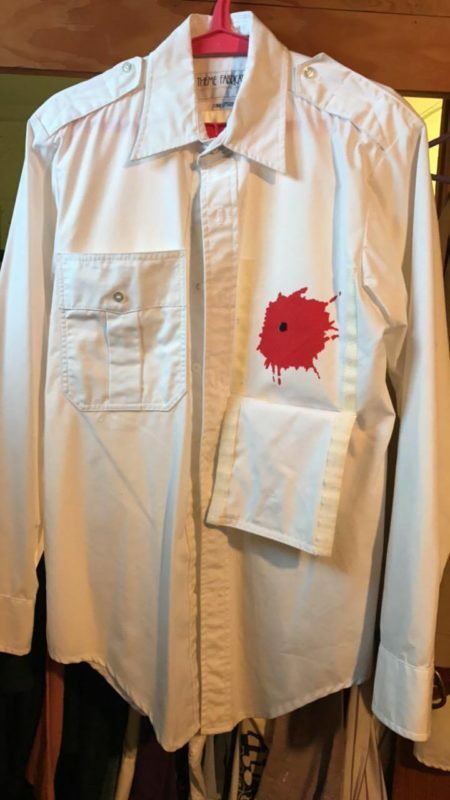 However the ride and its unprecedented level of cast member interaction lives on in our memories, on YouTube and in at least one faux bloody piece of wardrobe kept safe for nearly three decades and counting. 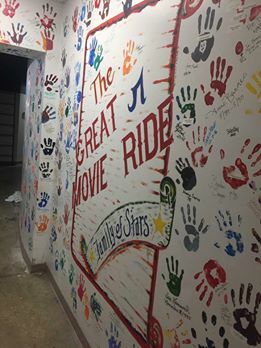 The GMR cast members had thier own handprint wall of fame mimicking the celebrity handprints cast in cement at the front of the building. Will this remain? This entry was posted in Lost and Abandoned Disney Details and tagged Disney MGM Studios, Disney's Hollywood Studios, Great Movie Ride. Bookmark the permalink. The blood patch was not for the Western Scene. It was in the Gangster scene. The Tour guide would get shot once the gangster car pulled out and the gun fire started. They would pull the pocket patch and the suspenders on the same side revealing the blood. Then they would fall offstage onto a mat, crawl off it and head up to the Anubis scene. Only the men’s costumes had the blood spot. It was deemed it would be inappropriate for the women to have one because of where it was on the chest. It was discontinued due to injuries with the fall and the fact that these were Operations Cast Members not Entertainment. That’s great info Gray, thanks! We will make a note of it in the post. I would kill for the opportunity to read that 60 page script. That is awesome and a shame that it never made it into the ride. If they expected little kids to “handle” an Alien jumping out of the wall and ceiling at them they should have expected kids to “handle” a little fake blood. The TCM version of the ride so diluted the cast member I’m surprised they kept the hijacking aspect of it at all. Yea we think it’s cool as well but Disney is not big on blood (for good reason). Remember what happened to Big Red at Animal Kingdom. Very true. I had forgotten about Big Red. Its just a little odd at the time what the thought was too much for kids, especially in the 80’s when you could get away with a lot more in terms of kids’ entertainment. I’m just glad I’m a child of the 80’s. To be fair we don’t really know why they never used this. It may have been the blood but could also be any number of other things. It’s just cool that they explored something so interactive way before that was a thing.